Few places are hidden likes the gems and are to be discovered. 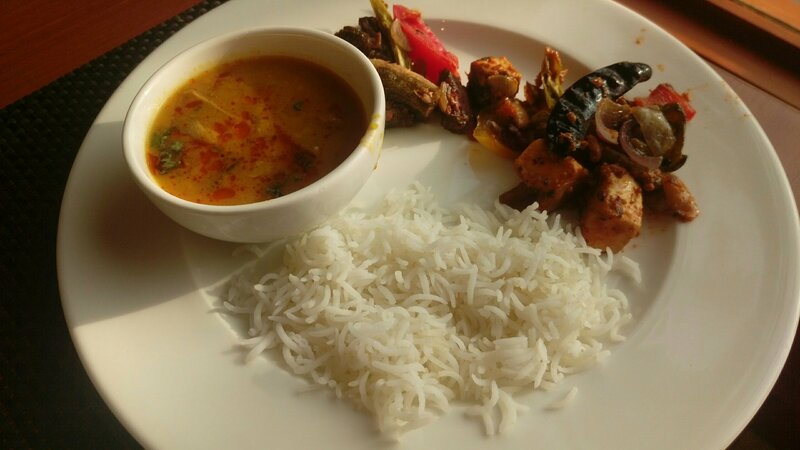 Palmyra World dinning is one such place that offers multi cuisine dinning experience on the rooftop at Bristol Hotel. 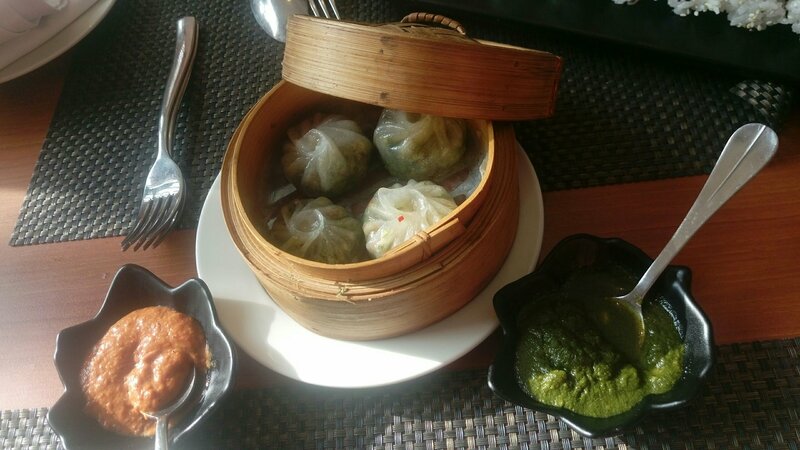 Food2go4 is all set to take you on a gastronomic journey at Palmyra the world dinning and I am sure you will thank me later for this amazing dine in place and will surely be the best dinning experience you might have imagined at Hotel Bristol. 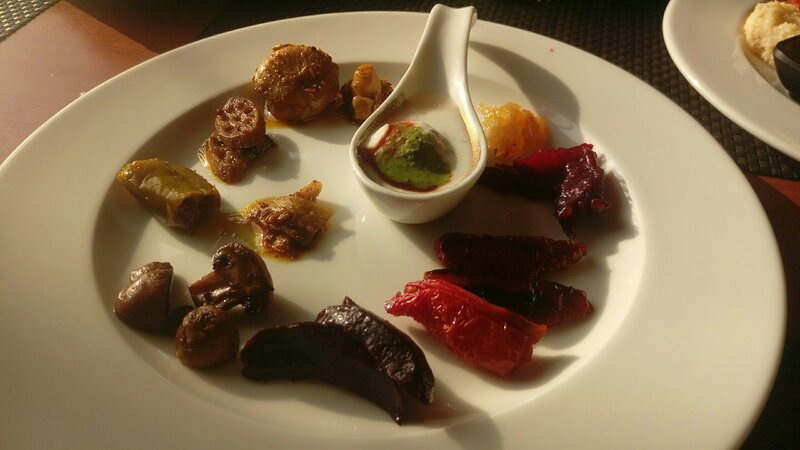 For me this was my first experiencial Dine in visit to Palmyra, at Hotel Bristol and I had no idea that this place will take me by so much surprise offering food that will make me crave to come back. So they start you with a welcome drink that comes from their adjoining Bar. As Palmyra was earlier a coffee house now is being transformed into a all day dinning. 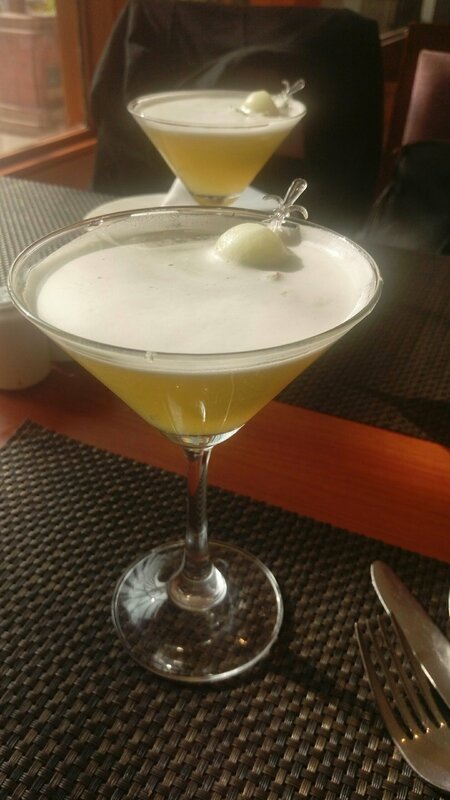 Melon Mania : I love melons, my all time favorite mocktail is with watermelon in it. But this one was my first experience with Musk melon. And it was amazing, though I have ordered for a Lassi ( I know this might sound so flat and desi, but that’s what I wanted to have before getting on to surprise melon mania ). So this is now officially my 2nd favorite mocktail. And those melon balls were hard to resist. I gulped one and wanted more 😊. And here comes my Lassi and I wish I had not ordered it, as i seriously wanted to retain the freshness of melon mania. But then one cant waste what one has order. Frankly speaking who goes for a Lassi before food. Unfortunately at times I do and this is a proof by itself. 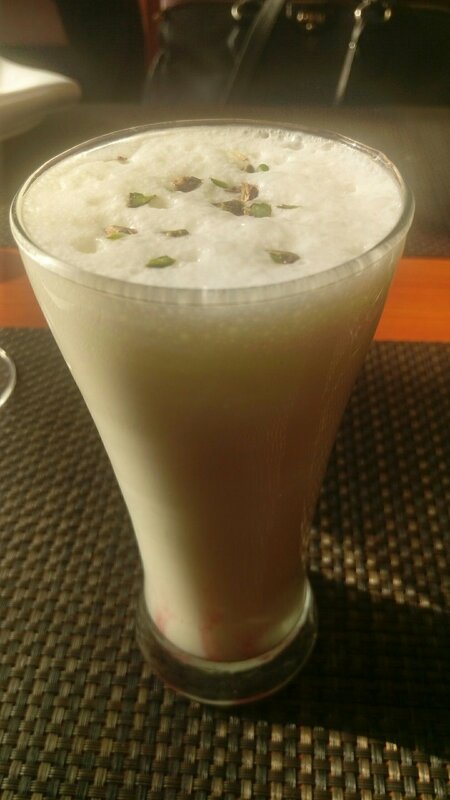 Sweet Lassi : A perfect blend of consistency and sweetness garnished with pistachio made is much more desirable with a hint of rooh afza adding that refreshing summer feeling to it. And now let me take you to the most interesting part of the menu that I had at Palmyra. Sushi yes! , I really want to scream out loud YES they serve SSUUSSHHII and this killed my belief of only going to authentic Japanese restaurant for having world class Sushi. 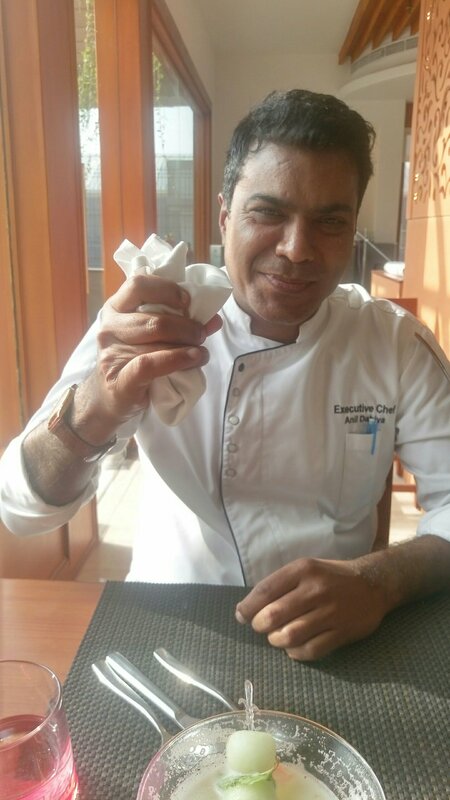 This is now my place to come for and all Thanks to Chef Anil Dahiya , probably he heard me say – Oh woow you have Sushi as well. Get me one Veg Sushi with Avacardo. 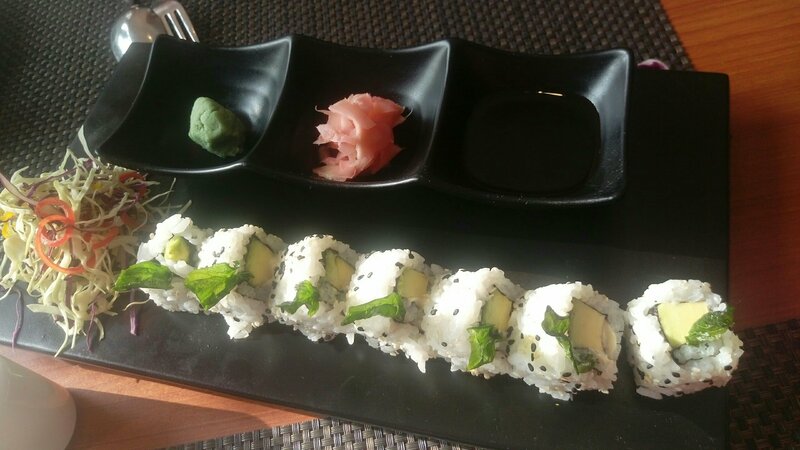 While I was gulping down these Yummylicious sushi and my mind racing to plan my next sushi visit to this place, I was surprised by the August company of the Chef Anil Dahiya himself with another of his Chef special – Crunchy Peanut & Pickled Cucumber Sushi, yes another vegetarian Sushi which will give a run to non veg Sushi on the house. It had one of my favorite ingredients Peanuts in it and for that I want to give you a closer looK to this Sushi. 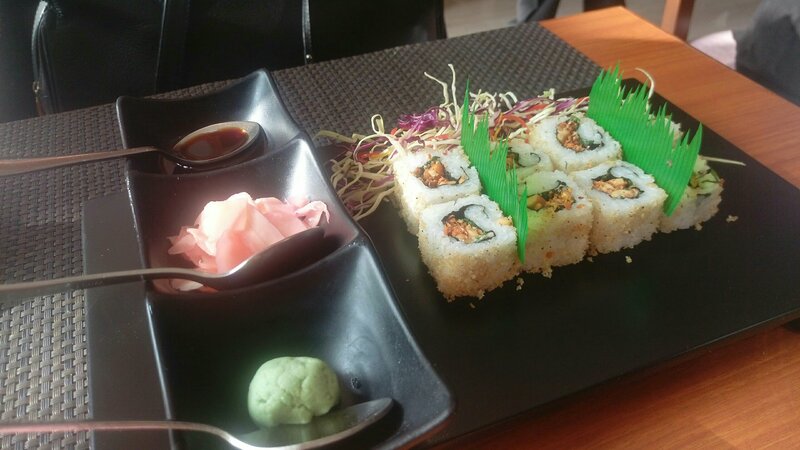 For the first time ever since I started having Sushi, I had a sushi that was crunchy too. 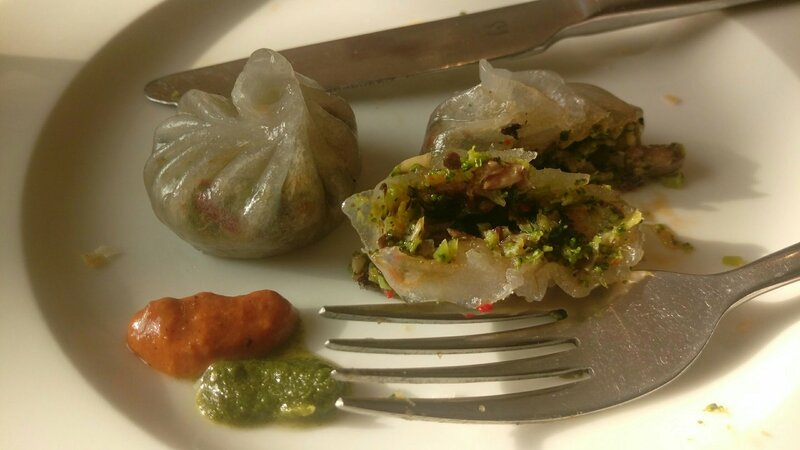 Here’s to the 2 last thing from the Ala carte before I get on to Buffet Treat and this one was healthiest dumplings I ever had. Steamed Crystals with Broccoli, Mushroom : I am not a dumplings persons normally but this combination appeared a rare one and with health on my mind I opted for it. Nicely grated mushroom and broccoli filling probably comes from a moms kitchen where she is determined to make the kid eat the greens. Jokes apart but this was one of the most palatable Brocolli I had in a filling that was all good to the core and healthy was a bonus to it. Served with 2 different chutneys but trust me these crystals were great on taste that I skipped the chutney on my plate. 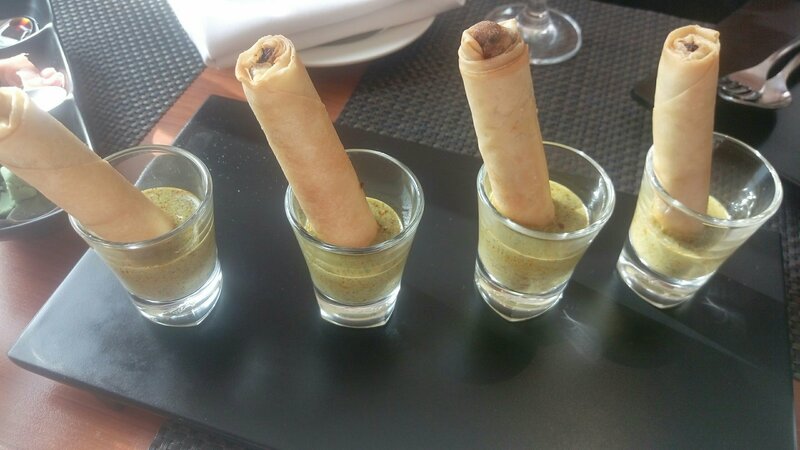 Paneer Khurchan Roll : last on my alacarte list was Paneer Khurchan rolls ( Vegetarian and Paneer go hand and in hand) Charred Cottage Cheese, Coloured Pepper Crisp Roll, Pickled Wild Mushroom, Coriander Peanut Butter Chutney made this amalgamation truly droolworthy. And yet again peanuts made it to my heart. 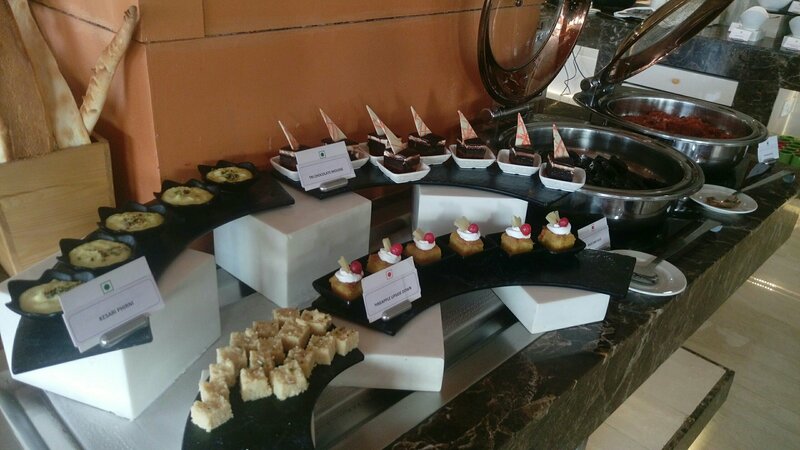 By now you know that I am already done but since I committed to take you through the Buffet as well so here I am taking you through the yet most important part of the Dinning experience at Palmyra is their Lunch and Dinner buffet. Moving on to main food on my plate it’s Dal, Karari bhindi and Paneer veg accompanied by Green chilli Lachha parantha to neutralize the sweet pickles and cleanse the palate for the Desserts. 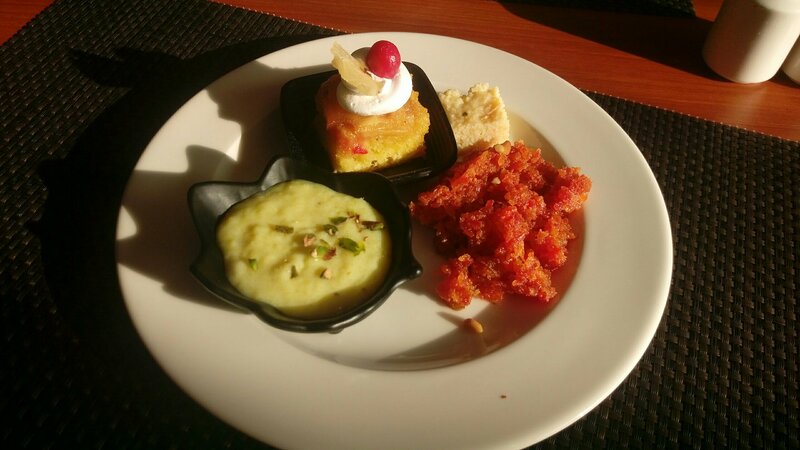 Dessert : They have a good assortment of Desserts with a combination of sweets from gajar halwa to Brownie. Gajar Halwa makes the best winter dessert and having it Under the sun at the open terrace made the experience even better. While I also picked Phirni , freshly made kalakand and a cake. 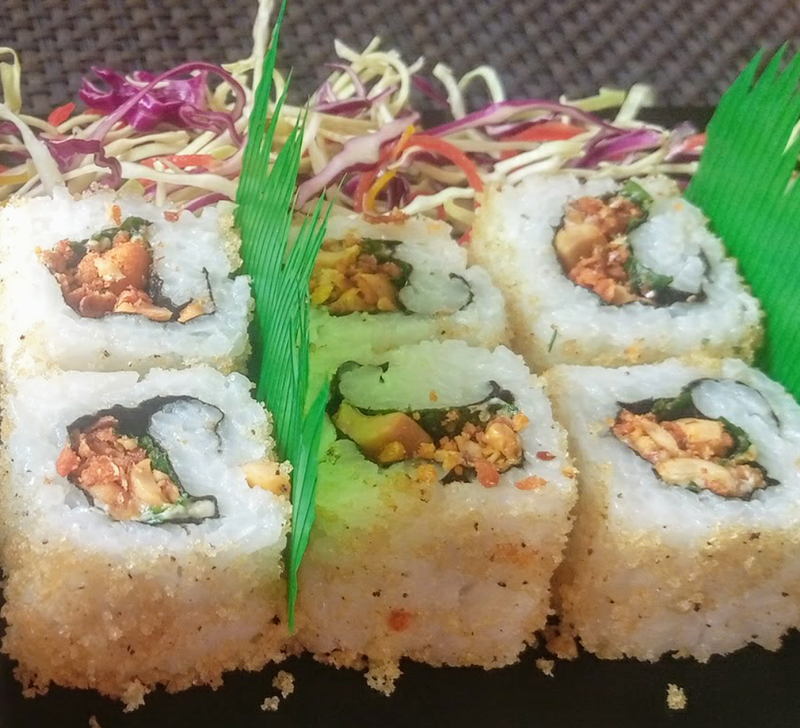 Overall a great experience and still I can feel the taste of chef special Peanut Sushi, They have great Christmas and New Year Brunches being planned so don’t miss out this place in Gurgaon for a sunny brunch to make your day more pleasant this winters. You may also plan a working Brunch as I did to mix food and work,who knows you may nail the business deal that had been long pending .